Sigur Ros’ performance at Starlight on Thursday night felt more like being cast under a spell for nearly two hours than seeing a rock show. The Icelandic trio rarely spoke to the crowd and preferred to sing Hopelandic, an imagined language. Carried by singer Jonsi Birgisson’s angelic falsetto, the linguistic structure only enhanced the trance. Unencumbered by English, the songs could be about whatever you wanted them to be. Augmented by three piece horn and string sections and a pair of multi-instrumentalists, the group created heavenly textures that juxtaposed near operatic beauty with stains of hard rock. The M. Night Shyamalan of ensembles, Sigur Ros patiently builds layers and moods before suddenly whisking the listener around in another direction. This was especially true on “Hrafntinna” which build tension from discordant horns before ending with a lush brass coda that wouldn’t have been out of place at the Kauffman Center. Arrangements are designed so that each part complements without drawing attention until suddenly the key instrument emerges at the perfect moment. Despite the presence of so many musicians, the mix was pristine. On “Festival” I could hear bass player Georg Holm’s pick hitting the string on each heavy downstroke. Sigur Ros ended a three-year hiatus with the release of their sixth album, “Valtari,” last year, the band has already moved on. One quarter of the setlist drew from the new record “Kveikur,” which is scheduled for release in June. The material blended well with the older songs, but also showed a new, darker dimension. The title track featured digital textures, exotic percussion and heavy drums. “Brennisteinn” opened with a nasty, distorted synth bassline and sounded like a musical wrestling match between good and evil. The setting was nearly as expansive as the sound. The first two numbers were delivered behind a trio of sheer veils, which cast wild shadows and broad colors. 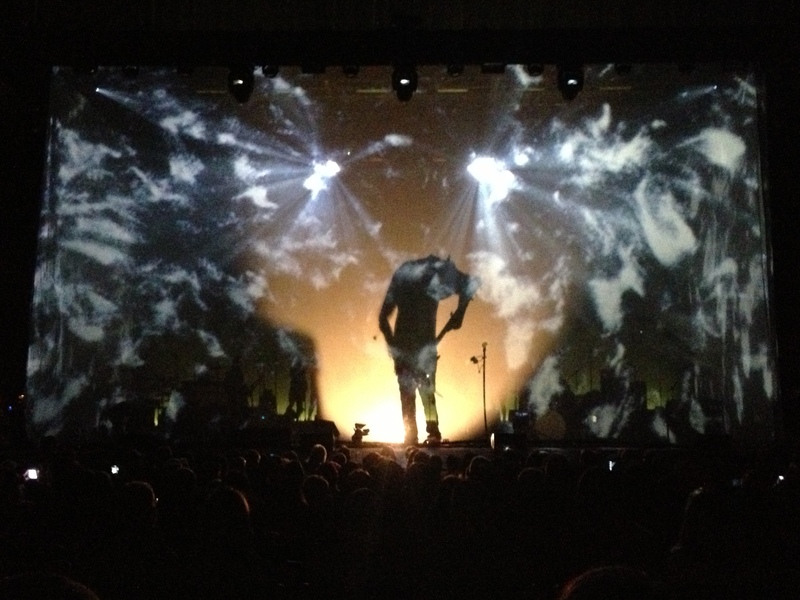 When the curtains fell, a video screen spanned the width of the stage, projecting images of nature. The slow pan of craggy rocks gradually revealing a mountain range on “E-bow” made the stage seem like it was moving. The low-50s temperature reinforced the mood cast by pictures of rainstorms, bleak landscapes, flashlights in fog and other monochromatic patterns. Starlight was three-quarters full, optimistically, and the audience soaked up every moment in reverie. There was very little talking and most applause was held until the end of a piece. The big exceptions were the one-two of “Hoppípolla” and “Með Blóðnasir” which spontaneously had the crowd on its feet with evangelistic fervor. The joyous horns at the end of “Festival” rang out like church bells on Christmas Day and inspired a few pockets of dancing. Setlist: Yfirborð (new song); Ný Batterí; Vaka; Hrafntinna (new song); Sæglópur; Fljótavík; E-bow; Varúð; Hoppípolla ->Með Blóðnasir; Kveikur (new song); Olsen Olsen; Festival; Brennisteinn (new song). Encore: Glósóli ; Popplagið.